Coaldale Copperheads losing the past three games in two weekends find their first place standings threatened. Copperheads short benched with some leading players out of the line up created a new challenge for the team. This past weekend they faced second place Okotoks Bisons at home losing 6-3, one an open net goal. This marks the first win for the Bisons in the four regular season games against the Snakes. Jayden Smith, overage player, showcased excellent effort scoring two goals. As well, Jared Bainbridge with his consistent speed effort scored a lone goal. Broc Merkl was player of the game facing 26 shots. 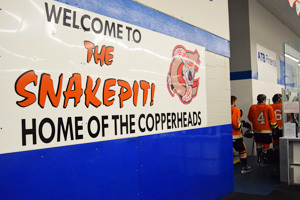 Sunday mid afternoon, the Copperheads traveled to Cochrane. It was a even balanced game throughout with shots totally even at 14 and 25 in the first two periods. Ty Abbott opened the scoring at 7:49 of the first period with the Generals getting one at the end of the period. Second period seen Copperheads Jedd Horvath working hard to obtain a goal but Cochrane sealed two more. Third period was back and forth with each team scoring two goals leaving a final score 5-4 loss for the Snakes. Two goals that period were scored by Jayden Smith and Brandyn Howg on the powerplay. Goaltender Nolan Berner was solid facing 35 shots for the Snakes. Copperheads ended up taking 40 shots in the game along with only two penalties. This leave the top south standings after the weekend: Copperheads 54 pts ( 26-7-2) and Okotoks 53 pts ( 25-7-3) both in 35 games. Cochrane in 33 games ( 24-7-2-0) with 50 pts. Coming up to end off the complete 38 regular league game schedule will see the Snakes heading back to Cochrane this coming Friday, Feb. 1. The game is set for 7:00 p.m.
Saturday night, Feb. 2, will be the final home game of regular season at 8:30 vs. Medicine Hat Cubs. This will be the last night to use up those season tickets. The following weekend, Sat. Feb. 9, they have their last league game on the road in Ponoka.